Totally cute, I love this image and you have done a great job with it. Thanks for joining us this week for our "Punches/Dies." Come back to join us again and good luck. So cute! I can't believe someone else saves that plastic netting. We are kindred spirits! Hugs! Oh course you can do CAS - and this is a perfect example!! Love that cute image and the way you used the veggie netting for the background is so creative. Guess I'll have to start saving mine now and trying that! Fantastic card! OMGosh! This really made me smile! What a really fun card and your colors are perfect for his escape!! Your background looks great and this is so cute. It reminds me of a funny story. When I had my first son in a hospital, they had those cotton gowns that tie in the back. I used a 2nd gown as a housecoat by tying it at the front. At that time all newborns were kept in the nursery, but mothers could wheel the crib/incubator to their rooms and back. One day I was wheeling little Paul back to the nursery. Many visitors, including new dads, were milling about the hallway. As one brushed passed me I felt a sudden draft at my back. You guessed it. I had forgotten my 'housecoat'. So very, very cute - and the image and sentiment gave me a giggle! Thanks for joining us at MFP's Speedy Fox & Friends challenge. 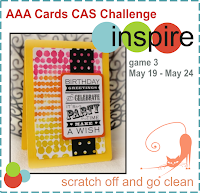 Well done with this CAS CASE of Linda's card! That background is so creative! Thanks so much for playing at AAA cards this week! I love your choice of image - so made me smile! Thanks for playing along at AAA Cards again this week. Brilliant.....love that image & oh my, those hospital gowns!!!!! Oh, those gowns....too cute. Good job with the background, too...very clever. Connie, your card absolutely brings a smile to my face! It's great to have you playing at AAA Cards! 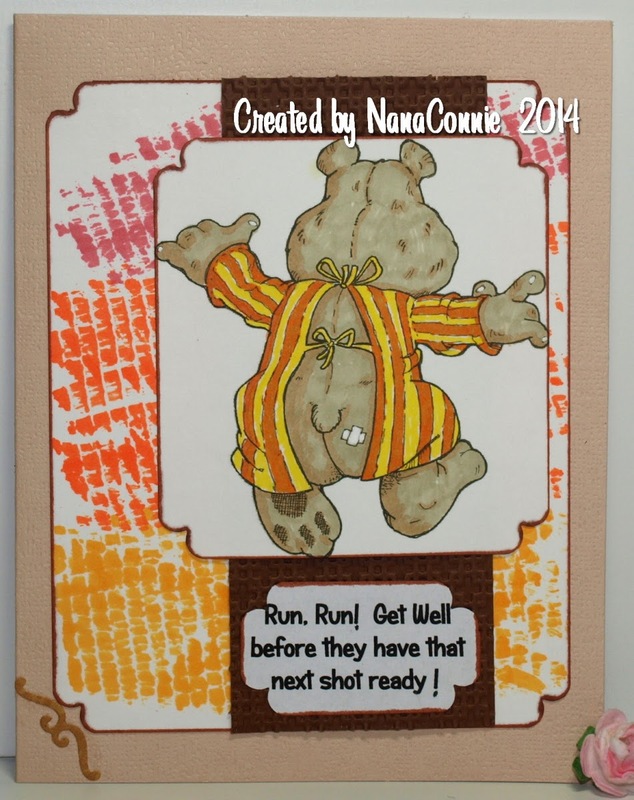 A great fun card NC, all the hospital gowns I have ever worn have been like this one LOL. LOL Connie, this sure made me chuckle, I could imagine my Rick doing this after his small op a couple of weeks ago. Great card and loving the background and sentiment. So stinkin' cute!!! Love your sentiment, too! What a hoot. Love your card. Thanks so much for joining us at AAA Cards. Haha! This made me LOL!! Sooooo cute!! That is fantastic! love the sentiment! Thanks for playing over at the paper nest dolls with our anything goes challenge! good luck! Super cute image and sentiment but your bg makes it all shine! Fabulous way to create pattern and color without using DP! Thanks for joining Speedy Fox & Friends Challenge this week! Great fun card,made me smile. Love the colours on the background. So much fun!! Thanks for joining us at the Orange and Lemon challenge at http://graphitmarkers.blogspot.co.uk/2014/05/wk-20oranges-and-lemons-graphit.html - good luck! LOl! Such a cute CAS card! I love the image & the sentiment! How cute! Love the colors. Great project. Thanks for playing at Glitter n Sparkle. We hope to see you next time. Good luck. Hilarious, I love quite a few of QKR images, must get me some! !